Kaffa, the birthplace of Coffee. Yes, the world-famous, delicious, black drink really comes from this mountainous region in the Southwest of Ethiopia. Protected by very steep slopes, wide chocolate-coloured rivers and fabulous rainforests, the Wild Coffee plants thrived here for centuries, providing the precious beans -possibly the best in the world- to the people living in the area. A thick array of hundreds of moss-covered trunks, silvery-green leaves and bright red beans, the coffee forest is truly a unique place to be in. Unfortunately, current population growth compounded by increasing poverty levels has led to rapid deforestation. People living in these areas are forced by their economic situation to convert the rainforests to farmland and/or sell them to foreign investors. With a loss of 15-20% each year, the rainforest, which previously covered more than 30% of Ethiopia, now only stands at three. To save this land and the people, NABU, GTZ, "GEO-Schützt den Regenwald" and several other partners are running a PPP (Public-Private Partnership) conservation and development project in the Kaffa Province, contributing to improving the livelihoods of coffee producers and to developing sustainable coffee production and marketing to international quality standards. The living conditions of the coffee farmers are being improved through higher income and flanking social measures. Moreover, there is the plan to establish the first ever "UNESCO Man & Biosphere Reserve" here in Ethiopia , always with the goal to involve people in the management and protection of their land. At the beginning of December, the German environmental organization NABU assigned me to travel to the Kaffa province and photograph as much as possible of the land and of the incredible biodiversity featuring these endangered forests. Once arrived in Bonga town, with less than 10 days to work there, I had the privilege to roam freely among the last afromontane rainforests of Ethiopia, but also had to face the frightful, impossible task of giving justice to this incredible place with my humble work. Blown away by the abundance of wildlife and the beauty of the different landscapes, I worked very hard, bringing home a little less than 4000 digital images. Speeding across the dusty roads and sweating on the steep slopes of this region, with the valuable help of my friend and guide Yahiya Adem, I portrayed curious Guereza monkeys, angry Hippopotamus, mystical Bamboo forests and elusive Turacos. I have stepped across a Leopard trail and got painfully bitten by huge leaf-cutter ants. I admired dozens of bird species and met some of the most pleasant people ever. And, on my very last afternoon in Addis Abeba, I even had the chance to advocate for the establishment of the UNESCO Man & Biosphere Reserve in Kaffa! 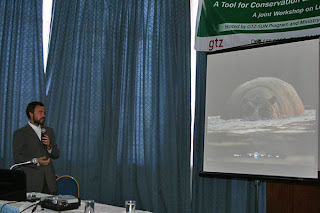 In a borrowed white shirt and grey jacket, I spoke and showed some quickly prepared pictures during a workshop day attended even by the President of Ethiopia and the Minister of Science and Technology!